K.G. Wilson and M.E. Fisher, Critical exponents in 3.99 dimensions, Phys. Rev. Lett. 28 (1972) 240 [INSPIRE]. P. Jefferson, H.-C. Kim, C. Vafa and G. Zafrir, Towards Classification of 5d SCFTs: Single Gauge Node, arXiv:1705.05836 [INSPIRE]. A. Iqbal, All genus topological string amplitudes and five-brane webs as Feynman diagrams, hep-th/0207114 [INSPIRE]. N. Nekrasov and A. Okounkov, Seiberg-Witten theory and random partitions, Prog. Math. 244 (2006) 525 [hep-th/0306238] [INSPIRE]. Y. Imamura, Supersymmetric theories on squashed five-sphere, PTEP 2013 (2013) 013B04 [arXiv:1209.0561] [INSPIRE]. Y. Imamura, Perturbative partition function for squashed S 5, PTEP 2013 (2013) 073B01 [arXiv:1210.6308] [INSPIRE]. H.-C. Kim, J. Kim and S. Kim, Instantons on the 5-sphere and M5-branes, arXiv:1211.0144 [INSPIRE]. O. Bergman, D. Rodríguez-Gómez and G. Zafrir, Discrete θ and the 5d superconformal index, JHEP 01 (2014) 079 [arXiv:1310.2150] [INSPIRE]. M. Taki, Seiberg Duality, 5d SCFTs and Nekrasov Partition Functions, arXiv:1401.7200 [INSPIRE]. H. Hayashi and G. Zoccarato, Topological vertex for Higgsed 5d T N theories, JHEP 09 (2015) 023 [arXiv:1505.00260] [INSPIRE]. C.-M. Chang, O. Ganor and J. Oh, An index for ray operators in 5d E n SCFTs, JHEP 02 (2017) 018 [arXiv:1608.06284] [INSPIRE]. Y. Tachikawa, Instanton operators and symmetry enhancement in 5d supersymmetric gauge theories, PTEP 2015 (2015) 043B06 [arXiv:1501.01031] [INSPIRE]. D.M. Capper and M.J. Duff, Trace anomalies in dimensional regularization, Nuovo Cim. A 23 (1974) 173 [INSPIRE]. I.R. Klebanov, S.S. Pufu and B.R. Safdi, F-Theorem without Supersymmetry, JHEP 10 (2011) 038 [arXiv:1105.4598] [INSPIRE]. C. Cordova, T.T. Dumitrescu and X. Yin, Higher Derivative Terms, Toroidal Compactification, and Weyl Anomalies in Six-Dimensional (2,0) Theories, arXiv:1505.03850 [INSPIRE]. D. Poland, D. Simmons-Duffin and A. Vichi, Carving Out the Space of 4D CFTs, JHEP 05 (2012) 110 [arXiv:1109.5176] [INSPIRE]. S. El-Showk, M.F. Paulos, D. Poland, S. Rychkov, D. Simmons-Duffin and A. Vichi, Solving the 3d Ising Model with the Conformal Bootstrap II. c-Minimization and Precise Critical Exponents, J. Stat. Phys. 157 (2014) 869 [arXiv:1403.4545] [INSPIRE]. D. Simmons-Duffin, A Semidefinite Program Solver for the Conformal Bootstrap, JHEP 06 (2015) 174 [arXiv:1502.02033] [INSPIRE]. C.-M. Chang and Y.-H. Lin, Bootstrapping 2D CFTs in the Semiclassical Limit, JHEP 08 (2016) 056 [arXiv:1510.02464] [INSPIRE]. S. Collier, Y.-H. Lin and X. Yin, Modular Bootstrap Revisited, arXiv:1608.06241 [INSPIRE]. Y.-H. Lin, S.-H. Shao, Y. Wang and X. Yin, (2, 2) superconformal bootstrap in two dimensions, JHEP 05 (2017) 112 [arXiv:1610.05371] [INSPIRE]. S. Collier, P. Kravchuk, Y.-H. Lin and X. Yin, Bootstrapping the Spectral Function: On the Uniqueness of Liouville and the Universality of BTZ, arXiv:1702.00423 [INSPIRE]. J.-B. Bae and S.-J. Rey, Conformal Bootstrap Approach to O(N) Fixed Points in Five Dimensions, arXiv:1412.6549 [INSPIRE]. T. Kugo and K. Ohashi, Off-shell D = 5 supergravity coupled to matter Yang-Mills system, Prog. Theor. Phys. 105 (2001) 323 [hep-ph/0010288] [INSPIRE]. T. Kugo and K. Ohashi, Supergravity tensor calculus in 5-D from 6-D, Prog. Theor. Phys. 104 (2000) 835 [hep-ph/0006231] [INSPIRE]. M. Ozkan and Y. Pang, Supersymmetric Completion of Gauss-Bonnet Combination in Five Dimensions, JHEP 03 (2013) 158 [Erratum ibid. 07 (2013) 152] [arXiv:1301.6622] [INSPIRE]. C. Cordova, T.T. Dumitrescu and K. Intriligator, Multiplets of Superconformal Symmetry in Diverse Dimensions, arXiv:1612.00809 [INSPIRE]. 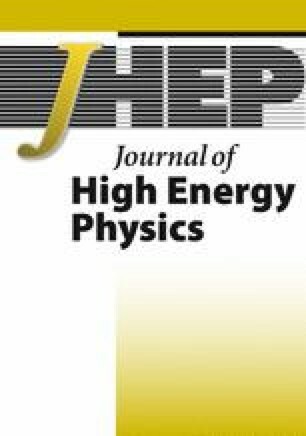 C.-M. Chang, M. Fluder, Y.-H. Lin and Y. Wang, Romans Supergravity from Five-Dimensional Holograms, arXiv:1712.10313 [INSPIRE]. M. Movshev, Deformation of maximally supersymmetric Yang-Mills theory in dimensions 10. An algebraic approach, hep-th/0601010 [INSPIRE]. C.-M. Chang, Y.-H. Lin, Y. Wang and X. Yin, Deformations with Maximal Supersymmetries Part 1: On-shell Formulation, arXiv:1403.0545 [INSPIRE]. A. Narukawa, The modular properties and the integral representations of the multiple elliptic gamma functions, math/0306164. C. Cordova and S.-H. Shao, An Index Formula for Supersymmetric Quantum Mechanics, arXiv:1406.7853 [INSPIRE]. 1.Center for Quantum Mathematics and Physics (QMAP)University of CaliforniaDavisU.S.A. 2.Walter Burke Institute for Theoretical PhysicsCalifornia Institute of TechnologyPasadenaU.S.A.